Pick up from Chennai airport/railway station. Check in to the Hotel and get ready for a sightseeing of Chennai- the bustling metropolis in Southern India. Visit the Fort St. George (the British built fortress, which still retains its colonial charm, San Thoma Basilica , the National Art Gallery, Kapalesswara temple. Later proceed to visit the sacred hillock St. Thomas Mount. It is a church built on a hilltop in 72 AD and that St. Thomas, the apostle of Christ, carried out his missionary activities there. . You can find how harmoniously the traditional Tamil culture and modern British culture are blended. Overnight stay at the hotel. Checkout from the hotel and drive to Mahabalipuram- a7th century former port city is famous for its rock-cut shore temples. 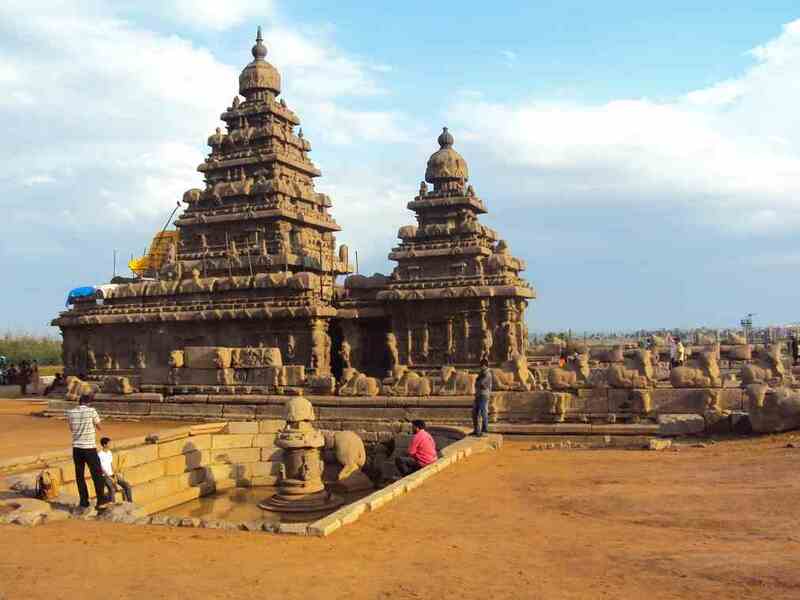 En route visit Kancheepuram which includes Kailasanathar Temple, Ekambareshwarar Temple, The Vardarajanperumal Temple. Check into the hotel and proceed for a sightseeing of Mahabalipuram.Visit Shore Temple, Five Rathas, Arjunas Penance, and Tigers Cave. Overnight stay at hotel. After breakfast check out from the hotel and proceed to Tanjore. - the ages-old capital royal of Chola Kings. Check into the hotel and thereafter start your sightseeing tours with the big temple Brihandeswara- 1000+ years old shrine, built by the esteemed Chola emperor Rajaraja and a fine masterpiece of Chola-styled architecture. Later, visit the nearby water tank Shivaganga and Thanjavur Palace, Royal Museum and Art Gallery. Return back to hotel and overnight stay at hotel. Proceed to Madurai- an extremely sacred city. It is the third largest city in Tamil Nadu and is located on the banks of River Vaigai. Check in at the hotel. Rest of the day is free for you to relax.Overnight stay at hotel. After breakfast at the hotel, proceed to visit Meenakshi temple-one of the largest cultural & architectural landmarks its kind in India and undoubtedly one of the oldest temple complex of in India which is dedicated to Goddess Parvathy. Visit Thousand Pillar Hall and musical pillars which produces different musical note when it is tapped. Then visit Mariamman Teppakulam -a beautiful square tank spread over a area of 16 acres and Thirumalai Nayakar Palace. Evening on leisure. Overnight stay at hotel. Check out from the hotel and drive to Chennai airport/railway station for your return journey.